Best Trail Mix Ever? It Gets My Vote. 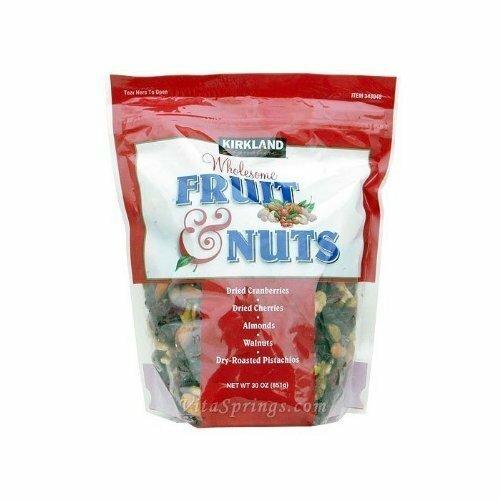 Sold under the Kirkland Signature label (the Costco house brand), Wholesome Fruit & Nuts consists of exactly five ingredients: dried cranberries, dried cherries, almonds, walnuts, and dry-roasted pistachios. The tangy sweetness and soft texture of the dried fruit (cherries especially) balance nicely with the savory crunch of the nuts. It packs a solid 140 calories per ounce, which translates into a lot of go-power for the weight. The ingredient combination also provides an excellent nutritional mix. According to the bag’s nutrition label, each 30 gram serving (just over an ounce) includes 8 grams of fat for long-term power, 15 grams of carbs for quick boosts (mostly sugars from the dried fruit), 4 grams of protein for muscle replenishment, and 2 grams of fiber for regular flow. Plus there are antioxidants (cherries) and Omega 3s (walnuts) in there as well. Depending on the Costco, a 30-ounce bag retails for only $9 to $10. At most grocery stores, you’ll pay nearly that much for a small 6-12 ounce bag of just one of the ingredients! If Costco isn’t an option, you can also order a bag for $16.99 through amazon.com.